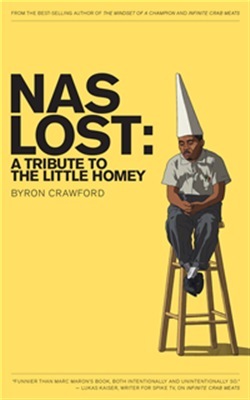 NaS Lost is the Nas book only Byron Crawford could write, and not just due to literacy issues in the hip-hop community. Billed as a tribute to the little homey, it is in fact a tribute, but not in the way that an article in XXL magazine is a tribute to a rapper. NaS Lost considers the artist's career in its totality, from its amazing highs to its crushing lows -- and some of everything in between. Discussed in NaS Lost: The 2001 beef with Jay-Z. What really led to this dispute? Nas and Jay-Z as Eskimo brothers. How the two of them became related in a sense. Nas' albums. Is it true what Jay-Z said, that Nas has a one hot album every 10 year average? Illmatic's five mic review in The Source. Was it really the best album of its era? The dreaded n-word. If KKKramer can say it, why can't Nas? Ghostwriting allegations. Can anything dream hampton says on Twitter be believed? The Virginia Tech controversy. What is the real cause of most school shootings? The hostage situation in Africa. Who was to blame there, Nas, the promoters, or the continent of Africa? Nas' marriage to Kelis. Bad idea, or worst idea of all time? Nas as a parent. Why is his teenage daughter posting her birth control on Instagram? Cultural tourism. Why is it that SPIN magazine likes a Chief Keef album more than Life Is Good? Acquista NaS Lost: A Tribute to the Little Homey in Epub: dopo aver letto l’ebook NaS Lost: A Tribute to the Little Homey di Byron Crawford ti invitiamo a lasciarci una Recensione qui sotto: sarà utile agli utenti che non abbiano ancora letto questo libro e che vogliano avere delle opinioni altrui. L’opinione su di un libro è molto soggettiva e per questo leggere eventuali recensioni negative non ci dovrà frenare dall’acquisto, anzi dovrà spingerci ad acquistare il libro in fretta per poter dire la nostra ed eventualmente smentire quanto commentato da altri, contribuendo ad arricchire più possibile i commenti e dare sempre più spunti di confronto al pubblico online.